Festivals are no longer just about being at one with the music, dreadlocks and mud…..nowadays festivals are where the fashionistas go to be seen. The likes of Sienna Miller, Kate Moss and Kelly Osbourne – despite their stylists and 5* hotels – have raised the stakes, forcing us mere normal folk to try and look stylish whilst roughing it in our tents. But don’t worry…..help is here! 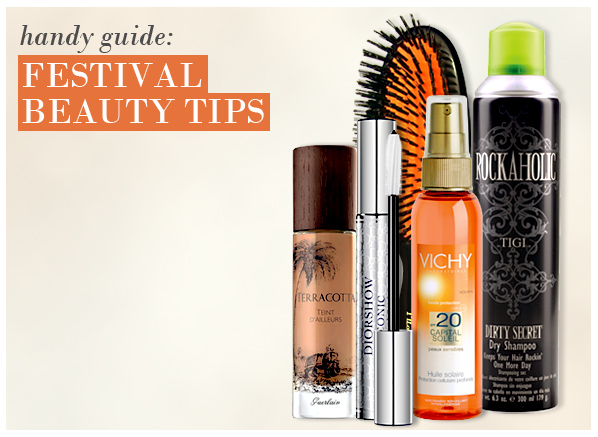 We’ve got a few tips and must-have products to help you strut your stuff in the sunshine! – Take a hat or head scarf – just in case! – Wear light make-up – because if it’s wet it’ll get ruined, and it’s sunny it will wear off with heat and sweat. Guerlain’s Terracotta Teint D’Ailleurs will not only give you a glow, but also contains a light sun screen. – If you want to go for the rocker look, use Bare Escentual’s Rocker Eye Tutorial kit, which includes shadows and liner to create the perfect look. – Make-up removal wipes, such as Klorane’s are a must . Although I have been using this for a while,am still looking for a product that I can leave in, stop the frizz and makes my curls look silky. Thought this might be it, but alas, not really. Still looking if anyone can suggest something please. This entry was posted on Monday, June 21st, 2010 at 8:56 am and is filed under Haircare, Hints & Tips, Make-up, Skincare. You can follow any responses to this entry through the RSS 2.0 feed. You can skip to the end and leave a response. Pinging is currently not allowed. Great stuff, this blog was recomended to me by seo it works! Thanks a lot for the good read; this is the stuff that keeps me motivated during my day. I have been searching around for your posts after being referred to them by a colleague and was delighted after I was able to find it after searching for some time. Being a blogger myself, I am pleased to see others taking initiative and adding to the community. Just wanted to show my gratitude for your contributions as it’s extremely encouraging, and many writers do not get the recognition they deserve. I am sure I’ll be back and will spread the word to my friends. Hi, You can subscribe via the links on the top-right hand corner of the blog. You can now even subscribe to email alerts.